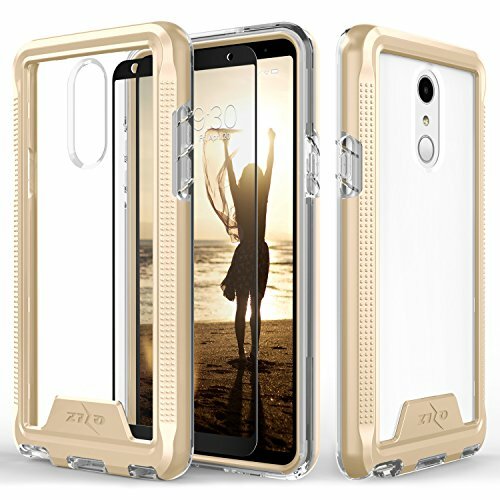 Zizo ION Series compatible with LG Stylo 4 Case Military Grade Drop Tested with Tempered Glass Screen Protector GOLD CLEAR by Zizo at All Company Mobiles. MPN: 1IONC-LGSTL4-GDCL. Hurry! Limited time offer. Offer valid only while supplies last. Lightweight, Transparent, and Low Profile. Introducing the Zizo [ION Series]. This LG Stylo 4 case is the perfect platform for expressing your style. A Lightweight, transparent & triple layered hybrid cover for your LG Stylo 4 phone. A complimentary Zizo 0.33mm Lightning Shield with 100% Clarity and 9H Hardness Full Glue Glass Screen Protector is included with each purchase. Our LG Stylo 4 ION case is compatible with the LG Stylo 4 phone.